Travel in colonial times was extremely uncomfortable and unpredictable. Many roads were little more than dirt tracks filled with ruts that became virtually impassable during rainy and snowy weather. Depending on road conditions, travelers could become lost as there were not road maps and the informational signs that we have today. In the mid 1700’s British officials recognized the increasing need for a more reliable network of roads in the American colonies. Planning and construction of a road from Boston to Machias began and was called the King’s Highway. Meanwhile in the colonies, Benjamin Franklin was appointed joint postmaster general by the British government. As part of his duties he conducted inspections of the roads that were used for delivering mail. Since one method of charging for postal service was by mileage, Franklin invented an odometer to more accurately measure mileage. This device was used to delineate mileage on roads that were designated as Post Roads. In Maine the road known as the King’s Highway was used to deliver mail from Boston to Machias and each mile was marked by Mr. Franklin’s new odometer. Thus, the King’s Highway morphed into the Post Road. 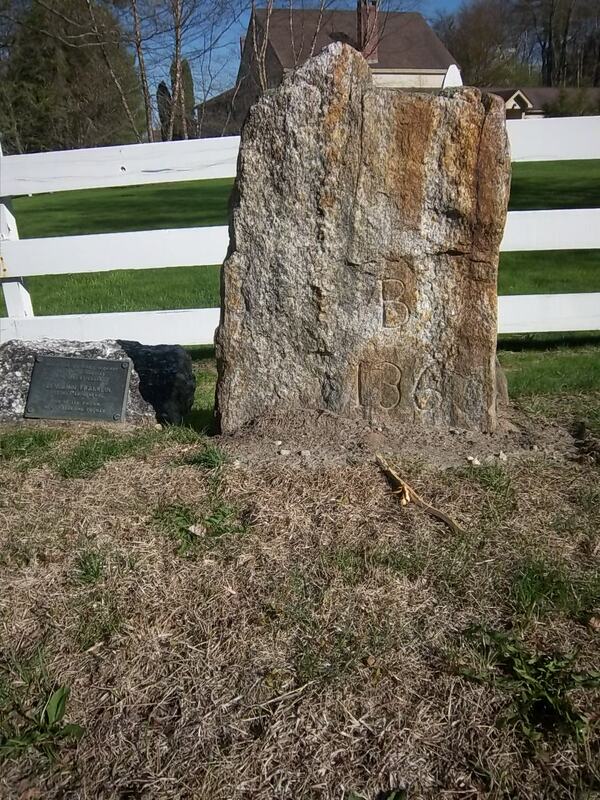 A marker, usually a stone, was erected at each mile and was chiseled with the number of miles it was from Boston. 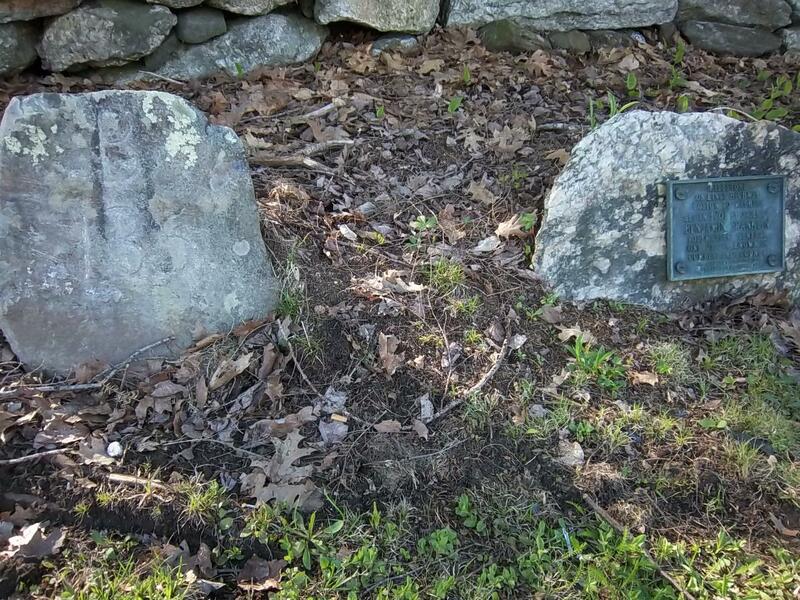 Town records indicate that these markers were placed in the early 1760’s. 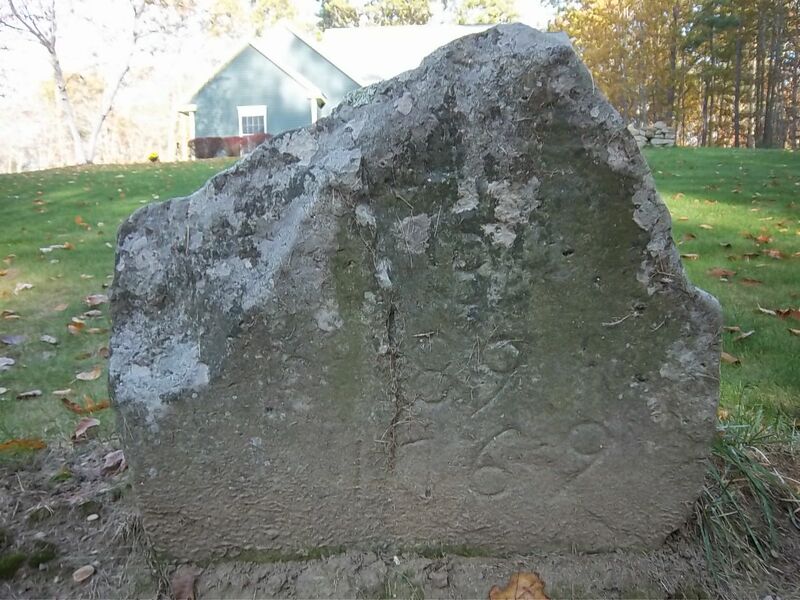 Some of these stones, pre-dating our Revolutionary War, are still in existence today – almost 250 years later! 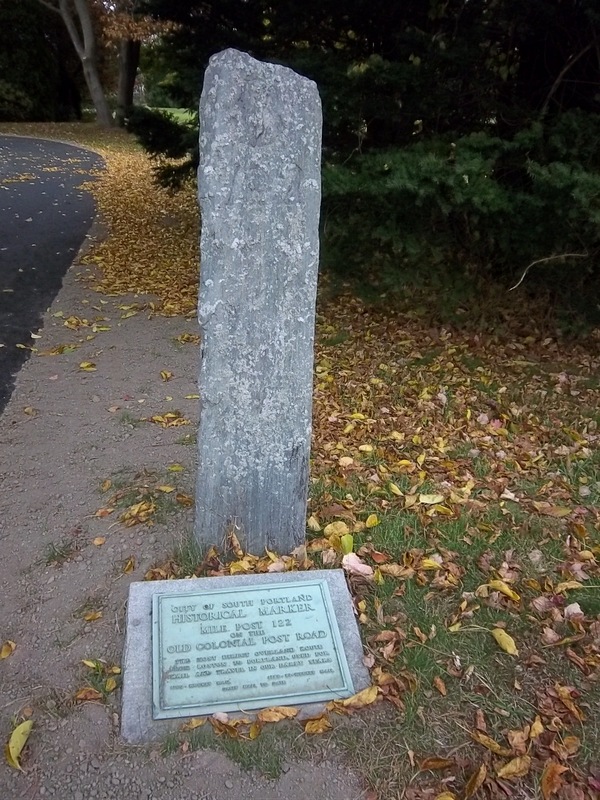 These markers also served as beacons to assure travelers they were still on the correct road and to let them know how far they were to or from Boston, or from an inn. I recently decided it would be fun to see how many of the existing markers we could find and so we made several sleuthing excursions. 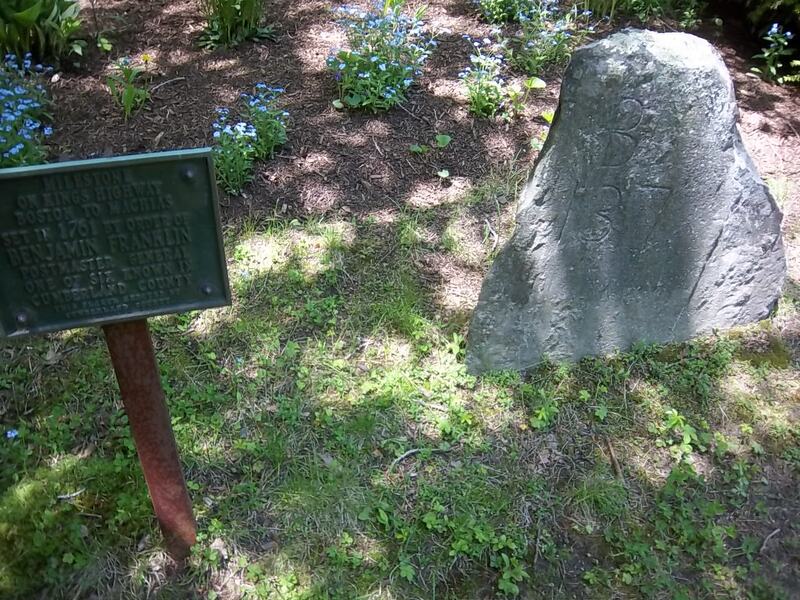 On Old County Road (which runs off CaptainThomas Road) Ogunquit, Maine there is a marker on private property. It is marked with 69 – meaning 69 miles to Boston. Note that each of these locations has a plaque saying the marker was erected in 1761 by order of Benjamin Franklin. Markers for miles 135 and 136 are located in Cumberland. No. 135 is in front of the property known as Top Knot Farm on the Middle Road. No. 136 is located on Route 88 near the Town Landing Road. 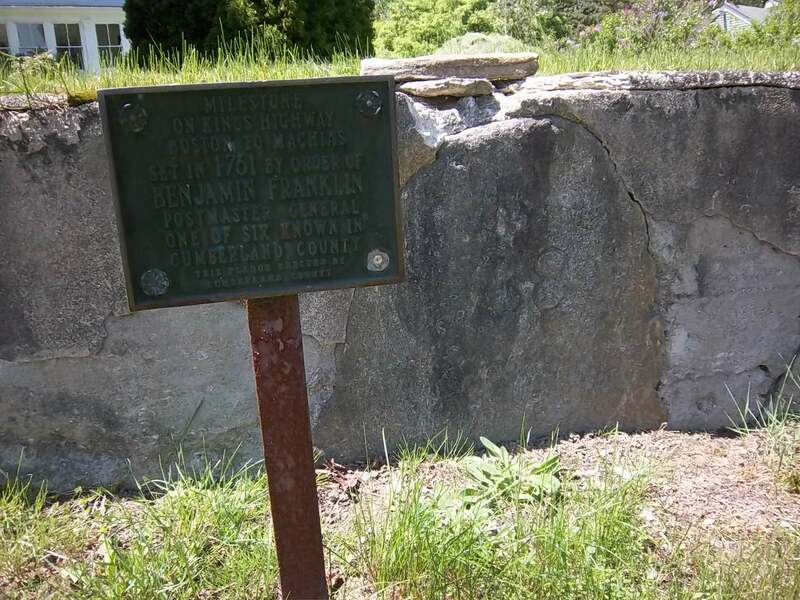 Note that the plaques in South Portland, Cumberland and Yarmouth indicate that they were erected by Cumberland County,. In Yarmouth, we found No. 137 and 138. No. 137 is on Route 88 on the left side, heading north. If you view these markers close up, the mile number is clearly legible. They don’t stand out as well in the size of the pictures here. No. 138 is on Pleasant Street and is embedded in a wall in front of a house there. My car’s odometer registered 1.1 miles between 137 and 138. I think that extra .1 of a mile is acceptable, 200+ years later. Today’s Pleasant Street is curved probably adding a little more distance between the two markers. It is a fun afternoon excursion to travel to these markers and reflect that it would have taken many more hours, probably more than one day, to make this journey in 1761 when these markers were erected. Since these markers are located in several different towns, I am leaving it up to you to choose a restaurant or ice cream stand for your meal. It will add to your fun to choose a new restaurant to visit! 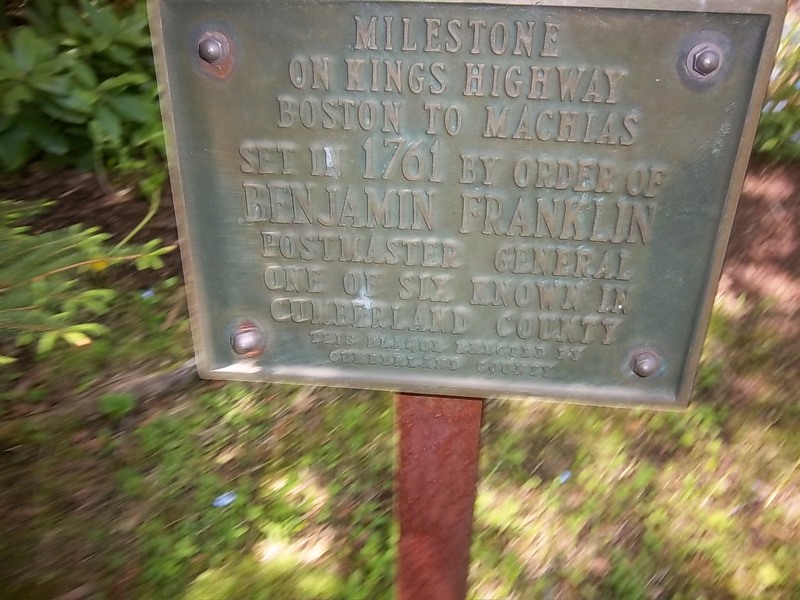 This entry was posted in Historical and tagged Benjamin Franklin odometer, Boston Post Road, Cumberland history Maine, Old King's Highway, Post Road markers, South Portland history Maine, Yarmouth history Maine. Bookmark the permalink.